Mr. Muffin’s Train layout has been a favorite of Indianapolis area families for many years, but in recent years, Mr. Muffin moved his expansive and detailed train layout to the far north community of Atlanta, Indiana. 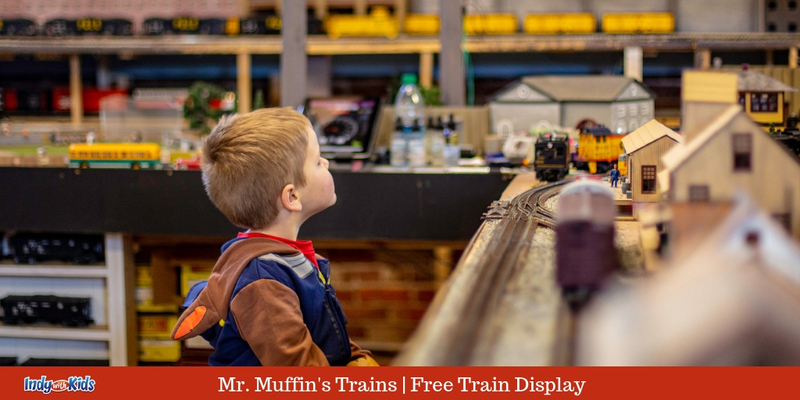 Mr. Muffin’s Trains in Atlanta, Indiana is still a part of Hamilton County and with the help of a few others, Mr. Muffin’s Trains has made Atlanta a destination for kids, families and adults who love trains! Every Saturday (and now Sundays, too! ), Mr. Muffin’s Train Shop and Layout are open for the public to come watch the electric and diesel trains run on tracks throughout a beautiful, hand made, hand painted, picturesque scene that takes up a large portion of the huge storefront. The trains wind and circle around small cities, carnival scenes with working amusement park rides, farms and other miniature realities. Owners Steve and Liz Nelson allow families to come and see, and sometimes help operate and run their collection of steam engines, diesel engines and electric trains. You might spend an hour just looking at all of the beautiful bridges and water scenery. Mr. Muffin’s Train Shop is a space where one of the top train collectors stores and displays and actually runs his trains. Just down the street, stop in and purchase your very first train set, LEGO train kids, train themed clothing and trinkets and more. Also down the street is the newly opened Choo Choo Cafe, serving up delicious food that’s better than home made — try the hash brown casserole! If you plan ahead, you can book a fun themed train ride on the Nickel Plate Express, Atlanta’s own railroad — we’ve tried the Reindeer Ride and the Pumpkin Express. You are invited to visit Mr. Muffins Train layout Saturday 10 a.m. – 3 p.m. and Sunday 11 a.m. – 2 p.m. Please call ahead or check Mr. Muffin’s Facebook page to be sure schedules have not changed or are different for vacation. Admission is free! Here’s all of the Indianapolis train themed fun! Find all of the Indiana train rides on our website.